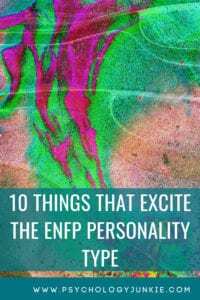 ENFPs are often celebrated for their enthusiasm and creativity. Natural idea-seekers, these types are always drawn to exploration and discovering the unknown. What things excite these types? What activities or experiences naturally bring them joy? Let’s find out! ENFPs love it when people get real and discuss their sincere hopes, fears, and dreams. They enjoy solidarity with others and empathizing with shared human experiences. ENFPs live to question traditional norms and think outside-the-box. They look at the world around them and generate possibilities and theories that may seem outlandish to some and genius to others. They want to turn things upside down and figure out how an innovative new idea might transform the world. ENFPs are visionaries who thrive when they can imagine future possibilities and opportunities. They get a thrill from discovering a new idea that they’ve never thought of before or a envisioning a potential they can’t wait to share with others. Does the idea of dropping all your plans and jumping on a plane to Australia sound exciting to you? Most ENFPs hate a routine existence and get a rush from switching things up with random, unexpected adventures. Natural questioners, ENFPs enjoy digging into abstract ideas and concepts with others. Exploring the connections between the unknown and finding new mind-bending discussions is thrilling to them. ENFPs find solidarity and inspiration in music that embodies their feelings, moods, or lifts their spirits. Whether it’s writing music, playing an instrument, or just listening to the radio, it’s clear that ENFPs have a strong connection to the musical world. According to the MBTI® Manual, ENFPs were over-represented in “Appreciating Art” as a leisure time activity. This coincides with what I’ve found from talking to ENFPs, who frequently mention creating art or looking at art as a major inspiration and satisfier. Also in the MBTI® Manual, writing was listed as the favorite leisure time activity of ENFPs. This isn’t surprising since many famous authors like Dr. Suess, Oscar Wilde, Mark Twain and Anais Nin were rumored to be ENFPs. Variety and novelty inspires ENFPs and makes them feel like they are truly living. Going somewhere they’ve never been before or meeting people from a different culture or lifestyle piques their curiosity and makes them feel like there are never-ending options to explore. Having an empty calendar or a weekend with zero plans is stimulating to ENFPs. They like to have a lot of different activities and opportunities available, but they hate being tied down to a schedule that confines them. They would much rather do things spur-of-the-moment than in a planned-out fashion. Do these things bring you joy? Are there any other things you might add? Let me know! You can also follow me on Facebook, Instagram, or Twitter. Want a Starter Kit for the ENFP Personality Type? Find out how to meet your potential and understand your personality type better here. (This is an affiliate link).